You will RECEIVE the COMPLETE BUNDLE of 5 ITEMS of this listing - BUNDLE of DANCE SHOES, SHOE BRUSH, Exclusive Wholesale Gifts POUCH BAG [beware of copycat], carry-on SHOE BAG & DANCE SHOE FRESHENER. Check all of them upon receiving your order and notify us if incomplete. •Your dance shoes. It is so lightweight enabling you to move smoothly & freely. You can dance all day or night & be the STAR of the dancing floor! •Your shoe brush which protects your shoes from dirt. Dirt free shoes enables you to move smoothly & freely on the dance floor. The practice of brushing your shoes' outer sole with wire brush will keep it like new for a long time, thereby saving you money. •Your Exclusive Wholesale Gifts small pouch bag which protects you from wire brush scratches. You may receive your pouch bag in a separate shipment without additional charges. •Your shoe freshener which makes your pair of shoes smelling fresh & ready to wear anytime you wish. •Your carry-on string shoe bag which enables you to carry your shoes during practice, competition or performance. You will pay more if you buy these items individually. So by simply ordering this bundle will save you money. So ORDER your dance shoes bundle NOW & lets go dancing! You will RECEIVE the COMPLETE BUNDLE of FIVE (5) ITEMS of this listing - BUNDLE of DANCE SHOES, SHOE BRUSH, Exclusive Wholesale Gifts POUCH BAG [beware of copycat] to prevent brush scratches, carry-on SHOE BAG & DANCE SHOE FRESHENER to freshens your shoes. Check all of them upon receiving your order and notify us if incomplete. WHAT THE PRO DANCERS WEAR: Lightweight pair of dance shoes is a must for professional dancers. Imagine wearing the same type of shoes for your competition, ballroom, salsa, latin, cha cha, rumba, east coast swing, bolero, mambo, foxtrot, Viennese waltz, samba, paso doble, jive, quickstep, merengue, bachata, west coast swing, lindy hop, charlston, balboa, boogie-woogie, hustle, Argentine tango, nghtclub 2 step, line, party, weddings, social dancing or dance lessons. Now you can. 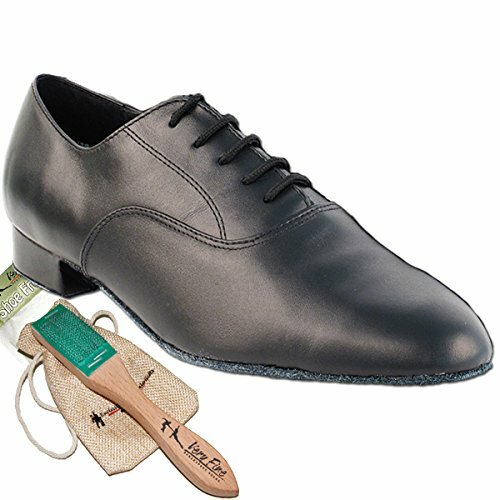 BEAUTIFUL & AFFORDABLE: You will expect to pay more for this affordable men's modern, elegant, comfortable and stylish dance shoes, but because of the manufacturer's ingenuity, you don't have to. An awesome best gift or present for you, your love one or someone special. So comfortable that dancers, just like you, wear them for hour and hours of dancing.